The law of diminishing returns applies to many things, but particularly to restaurant chains. The more outlets there are of a given brand, the less I want to go to any of them. As they achieve their economies of scale, they tend to compromise the food that got us there in the first place. But chains are changing. They can now be creative, modern, inviting. 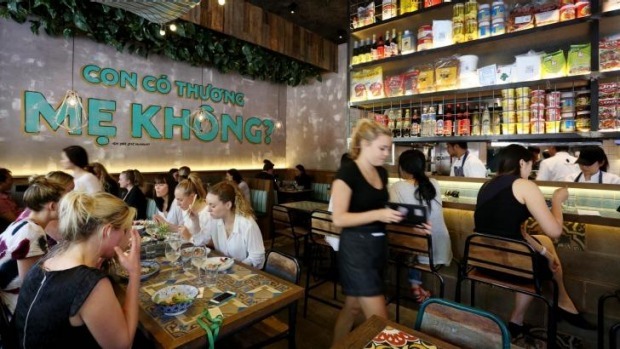 Take Mama's Buoi in Surry Hills, freshly rolled out from some of the partners behind Roll'd, the 20-strong Vietnamese take-away food chain, after the success of the original Mama's Buoi in Melbourne. A little extra charm comes from knowing that the recipes are those of co-owner Bao Hoang's mum. Craving the food he grew up with, Hoang has put the family recipes to work for the greater good. The Holt Street corner is now a cheeky, nostalgic evocation of the cafes of old Saigon, with its mix of booths, counter seating, tiled share tables and schoolroom chairs. Executive chef Tiw Rakarin and team work in a narrow, crowded kitchen behind a wall of colourful Vietnamese groceries, and windows are thrown open to the street, lined with wooden planters of lush Asian herbs. The menu is long, the prices reasonable (nothing over $24) and the food designed for both singles and groups to play cover-the-table with. Spring rolls are a good starting point, either fried or fresh. You get two crisp and blistery cha gio, Hanoi-style fried spring rolls ($7), well stuffed with pork and shredded vegetables, and a good chilli-flecked nuoc cham for dipping. Unfried goi cuon rice paper rolls ($8), filled with vermicelli and pork and prawn or barbecued chicken come with lettuce and mint leaves for wrapping. As good as Miss Chu's? Maybe, but I'm not the best person to ask, as I find almost all summer rolls beyond bland. A pile of crunchy-crisp, deep-fried school prawns punched up with fried shallot and hot chilli ($10) is the perfect pal to a chilled Ba Ba Ba (333) beer ($8). There's only one noodle soup on the menu – the classic pho bo dac biet ($9/$14), which always gets me excited because "dac biet" generally means there will be euphemistically "special" bits such as beef tendon and tripe. This one is strewn with rare beef, good bouncy beef balls, and fresh bean shoots and Asian basil galore. There's no tendon and only a suggestion of tripe, but the broth is delicate, clean and kicked with chilli. What else? 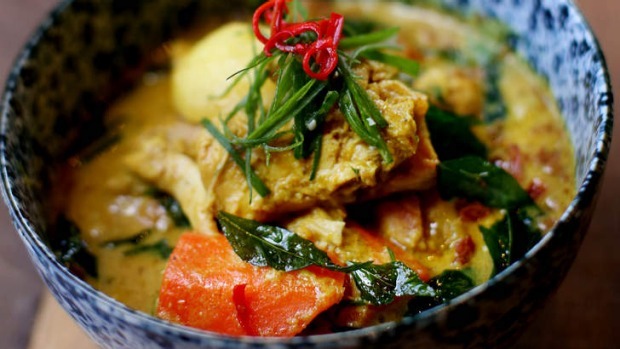 A homely, sweetly aromatic lemongrass curry chicken ($15) is a hit, with plenty of decent chicken in among carrots, potatoes and a curry sauce that requires mopping up with chunks of warmed banh mi bread. 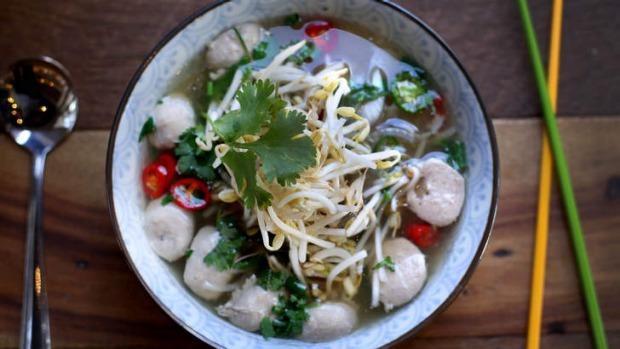 It's the sort of family dish that makes me homesick for the Vietnamese childhood I never had. A special of sticky, tender pork spare ribs ($18) feels more like overkill, with heaps of fall-apart meat on the bone and only a small noodle salad on the side. Drinks are more about cocktails (Ho Chai Minh, Saigon Sunset Sour) and juices than wine, although a Printhie MCC riesling from Orange ($12/$44) from the basic list packs a big fruity, floral punch. A homely bowl of banana and sago in coconut cream ($9) makes a warm, sweet and slurpy finish. Future Mama's Buois are already scheduled to open in Crows Nest and Darlinghurst early next year, with more to come. If they can keep up the quality as they add to the quantity, we might be in for quite a cool chain. Best thing: Home-style hotpots, cool salads. Worst thing: The shin-whackers (cross-bars under each table). Go-to dish: Xao ca ri ga: Lemongrass curry chicken with banh mi, $15.